The brief display of the state of IPv6 interfaces in the router (show ipv6 interface brief) is significantly different from the well-known show ip interface brief display as the IPv6 address might not fit in the same line as all the other data. To filter the printout and display only the operational interfaces, you have to replace the include filter with the section filter, which displays all the lines matching the regular expression as well as associated follow-up lines. The definition of the associated follow-up lines depends on the printout. Usually the indented lines are assumed to belong to a section, but you might be surprised. I had to do some precise QoS tests and needed a flooding tools that I could tightly control, so I rewrote the PERL UDP flooding program to include a few additional parameters: you can specify the desired bandwidth or inter-packet delay. You can download the new source code from the CT3 wiki. As my readers have mentioned in a comments to my previous post on this topic, you should use kernel-based floods for high-performance or you could use Iperf to do the UDP floods or TCP bandwidth measurements. However, as I do the QoS tests in a remote lab with virtual PCs that have no Internet connectivity for obvious security reasons, it's easiest to make changes to a PERL script over the console window. The last time I've configured X.25 on a router was probably 10 years ago, but based on features recently added to Cisco IOS it looks like the technology is still around somewhere … so I'm wondering: do you still use it in your network? Please respond to this week's readers' poll. 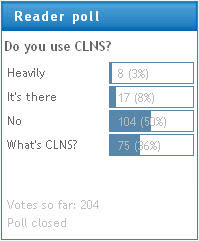 According to the results of the recent “Do you use CLNS?” poll, around 10% of my readers use CLNS in their network, while 36% of them wonder what that acronym stands for. Let's start with the acronyms. CLNS (Connection-Less Network Service) in combination with CLNP (Connection-Less Network Protocol) is the ISO (International Standards Organization) equivalent to IP. ISO makes a fine semantic distinction between the service offered to higher layers (CLNS) and the protocol used to implement it (CLNP). There is no such distinction in the IP world. CLNS (and CLNP) uses long variable-length addresses, making it a viable successor to IPv4. At the time when the IETF community started to design the next-generation IP (before IPv6 appeared on the drawing board), the proposals to use CLNS were taken pretty seriously even though they used interesting acronyms like TUBA (TCP and UDP over Big Addresses) and FOOBAR (FTP Operation Over Big Address Records). Follow the links in the previous paragraph, they point to actual RFCs. In the end, IETF decided to invent yet another protocol (IPv6), effectively quadrupling the IPv4 address size while retaining most of the benefits and drawbacks of IPv4. If I remember correctly, the technical explanation for this decision was the variable-length of the CLNS addresses (which make the hardware implementation of layer 3 forwarding pretty complex), while one of the real reasons was probably also the "not-invented-here" syndrome (and the lack of total control over a new protocol inherited from another organization). CLNS was widely used in early large IP networks primarily due to the multi-protocol implementation of IS-IS (the CLNS routing protocol that is roughly equivalent to OSPF), which came from DECnet phase V(anyone remember DEC, the maker of great minicomputers and probably the best operating system ever written?). Several very large networks used IS-IS at that time, forcing Cisco to optimize IS-IS code before they managed to fix the OSPF code. This led to an interesting phenomenon: the best-performing IP routing protocol was a protocol endorsed by ISO that was never designed (initially) to carry IP prefixes. When network engineers claim that they use CLNS in their networks, they usually want to say that the use IS-IS, which uses CLNS addresses to identify routers (similar to IPv4 addresses used by OSPF as the Router ID). The actual forwarding of CLNP datagrams (what I would consider the real usage of CLNS) is very rare today; the last time I've seen it, CLNP was used in the management networks to manage Sonet/SDH devices. According to one of the comments to my initial post, most of these devices support IP as the transport protocol today, making CLNP mostly obsolete. Anyhow, I've recently discovered that Cisco supports CLNS routing over BGP and wanted to write about it … obviously, based on the poll results, that would be a purely academic exercise. CCIE Pursuit writes about the usage of MAC addresses on SVI (VLAN) interfaces on various Catalyst switches. Some switches might reuse the same MAC address on multiple VLANs, leading to interesting problems if another box bridges those VLANs (for example, a transparent firewall). If you network has endless BGP convergence problems, our new BGP Quick Learning Module will improve your knowledge on this topic and enhance your hands-on configuration and troubleshooting skills. This e-lesson describes how you can optimize BGP convergence in your network without overloading the routers running BGP. The hands-on remote exercise will enable you to configure fast BGP convergence under various conditions and test the convergence times in a controlled lab environment instead of trying these techniques in a production network. I ran a few tests to document the differences between the fair queuing and FIFO queuing in Cisco IOS as well as the impact of queuing mechanism on the software/hardware queue used. The results are stored on CT3 wiki. A while ago I've been a co-mentor to a graduate student who investigated the difference between shaping and policing for his thesis. While doing the lab tests, he stumbled across an interesting problem: he could not configure fancy queuing (for example, CB-WFQ) on a point-to-point Frame Relay subinterface. The solution was to configure a QoS hierarchy, doing shaping first and queuing within the shaping queues. A few days ago, Arden Packeer covered the same topic in one of his blog posts, so it looks like the underlying problem (and the solution) is not as widely known as I had assumed. Time to write a tutorial on Queuing Principles in Cisco IOS. Quite often, you'd like to include results of various show printouts as the body of the e-mail sent by an EEM applet. It's easy to include a single printout: execute the show command with the action cli command and include the $_cli_result variable in the e-mail body (more details can be found in the Send email from EEM applet article). It's trickier to include outputs from several show commands in the same e-mail: you have to collect the outputs into a file in the router's flash, list the contents of the file and send the result. A while ago I've described a scenario where OSPF behaves like a distance-vector protocol, including creating temporary routing black holes. If you think this behavior might affect your network, it's best you test the details in a controlled lab environment. Our OSPF quick learning module will tell you how to tweak the OSPF parameters and how to prevent IP prefix reappearance in the original area. The blended solution also includes a remote lab exercise, where you can test the IOS behavior on actual routers. E-lessons are subscription-based; you can repeat each module in the lesson (including the lab) as many times as needed. One of the obscure facts of IPv6 OSPF (OSPFv3) is that it uses a 32-bit router ID like OSPFv2. It's a reasonable choice, I haven't seen an OSPF network with more than a billion routers yet. However, could you guess how this requirement is implemented in Cisco IOS? OSPFv3 searches for an IPv4 address (effectively the same algorithm used by OSPFv2) to get the router ID for the IPv6 routing process. Neat, isn't it? If you're a Cisco partner, you can run the Configuring OSPFv3 remote lab exercise free-of-charge from Partner Education Connection. Everyone else can get the same exercise as part of the IPv6 remote lab bundle from our learning store, where you can also buy the IPv6 Fundamentals, Design and Deployment (IP6FD) e-course. It's evident from the comments to my previous post on the non-transit AS implementation that I forgot to do my homework: I jumped straight into the implementation details without explaining the basics of non-transit AS and associated design rules. I hope I did a better job in a short article “(Non)Transit Autonomous System” which starts with the definition, describes the usual challenges of multi-homed end-users and the non-transit AS design and (at the very end) its implementation. Cisco partners can test the non-transit AS implementation in the Using Multihomed BGP Networks and Employing AS - Path Filters remote lab exercises. If you're don't have access to Partner Education Connection, you can buy our Configuring BGP on Cisco Routers e-learning solution or the BGP Remote Lab Bundle. Years ago, when the "fourth-generation computers" (looks like they've been renumbered to the fifth generation in the meantime) were as hot as Web 2.0 is today, we started talking about the generation after that which you could control with statements like “Do what I don't know how” ... and some of that mentality is already built into Cisco IOS. I've described the action mail command that allows you to send e-mails from EEM applets in several posts. However, the posts were always focused on a particular task and the various action mail options were mentioned in passing. The Send e-mail from EEM applet article contains a step-by-step recommendations on portable and scalable usage of the action mail command. In the IP Corner article The Never-Ending Story of IP Fragmentation, I've described the various challenges posed by IP fragmentation in modern IP networks. If you want a more in-depth look at that topic, check the new IP fragmentation e-lesson. It includes a recorded presentation and a remote lab exercise where you can test various fragmentation scenarios, including MPLS VPN backbone, GRE tunnels and GRE+IPSec combination. Just before this year's Partner summit, Cisco has launched Cisco Partner Space, a “virtual collaborative environment”. While I don't believe in the added value of eye candy, it sure looks nice. 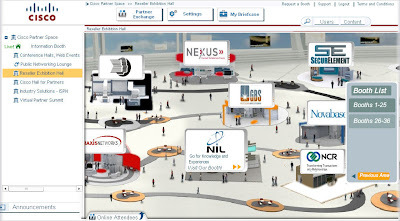 During the Partner summit, the Cisco Partner Space hosts the virtual version of the event, including the exhibitor booths. You can visit us by choosing the Reseller Exhibition Hall (what a nice name, isn't it … all of a sudden, their Gold Partners are caller Resellers) from the menu on the first page (after you log in), selecting Booths 26-36 and NIL from the Booth List. If you let me know when you'll go there, I might even be there to chat with you (I can't promise it, though). I've always considered building (almost identical) initial router configurations a waste of time, more so when I had to enter them manually, enabling interfaces, configuring IP addresses and Frame Relay subinterfaces on the fly … as well as entering dozens of commands that I feel should be present in every router configuration. When I finally had enough, I've stopped my non-critical lab tests for a few weeks (that's why there's still no answer on the very good question whether the NBAR started by NAT is of any use) and wrote configMaker: a PERL script that parses dynagen lab topology and produces initial router configurations based on a template file that you can adjust to your own needs. Read more about it in the CT3 wiki. If you want to test the ERM policies in a controlled environment, it's almost mandatory to have tools that allow you to overload the router. One of these tools is the UDP flood: if you flood a router's IP address, you're guaranteed to raise the CPU to 100%, with majority of the process CPU being used by the IP Input process (the interrupt CPU load will also be significant). 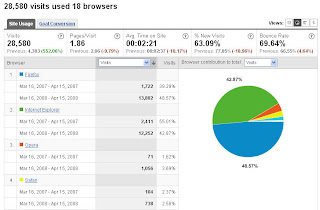 This phenomenon illustrates very clearly why it's so important to have inbound access lists protecting the router's own IP addresses on all edge interfaces. If you want to stress-test the router's forwarding functionality, you could use the host route to the null0 interface; all packets sent to that IP address will be CEF-switched, so the only impact of the UDP flood to the unreachable IP address will be the increased interrupt CPU load. I was able to increase the interrupt CPU load to close to 50% on a 2800 router using a virtual PC with a Fast Ethernet interface. And just in case you need it, here is the configuration from my test router. All packets sent to 10.0.0.22 are CEF-switched and dropped (the CPU load from the IP input process is negligible). The answer depends on how you got to the stage where you want to (or need to) attain the CCxP certification. Before going into discussions on “experience” versus “knowledge retention” (potentially “aided” by brain dumps), please read The Top 10 Problems with IT Certification in 2008 article published by InformIT. My potential disagreements with this article are so minor that I will not even try to document them. To learn something new and valuable resulting in a formal recognition of the effort. Don't even think about attending the bootcamps. If you're learning completely new concepts, go through the regular courses (or use e-learning combined with hands-on lab exercises). Highly intensive format of the bootcamps (after all, we're trying to squeeze almost two weeks worth of material into a single week) will fly way over your head. To formalize your experience ... either because you want to or because your employer needs certified head count (very common with Cisco partners trying to get better discount based on their partner status). In this case, a condensed bootcamp is usually the best option. For example, we had very successful bootcamp program a few years ago running back-to-back with the exams ... and, mind you, we used no cheating or brain dumps, the fact that the students took the exam right after the course obviously helped. Last but definitely not least, it's worth mentioning that not all five-day courses have five days worth of content. In these cases, condensing them into bootcamps makes even more sense. The information on the IOS XE software used by the recently launched ASR 1000 router is pretty scarce (there is still no link to the documentation available on CCO), but obviously some backdoor links already exist, as I was able to find some IOS XE-related documents with Google. One of the most amazing features I've found is the support for the security-oriented RFC 3514 which allows you to mark the security level of an IP packet. The RFC 3514 requires the end host to participate in the process, but as most operating system vendors still don't have a trusted computing platform, a transparent proxy has to be implemented on the network edges to properly tag the ingress packets. ASR 1000 has the first high-speed implementation of the RFC 3514 proxy thanks to its non-deterministic parallel QuantumFlow processors. The configuration of the RFC 3514 proxy is extremely simple: all you need to do is to configure auto-secure mark on the ingress interfaces of the ASR 1000. Once the security bit has been set, you can use the match ip security-bit 0|1 command in a class-map or a route-map on any router running IOS release 12.4(11)T or later (the command is still hidden).